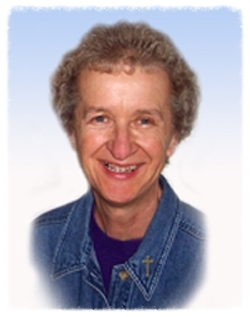 Karen Klimczak, Sister of St. Joseph, was a tireless servant of the gospel. Her many ministries included providing transitional housing for recently released inmates, visiting prisoners, finding a home for their families to stay and eat while they were visiting their loved ones in prison, and bringing youth together with parolees to hear their stories. Sister Karen led prayer vigils at murder sites throughout Buffalo to comfort the victims' families and friends, and as a witness to the community of peace and nonviolence. Sister Karen dressed up as a clown named Bounce to entertain at churches, schools, and senior centers. She celebrated Christmas with an annual party for the children and siblings of murder victims. She truly left PEACEPRINTS along her path in this world. In 1985, Sister Karen Klimczak founded HOPE House on Sycamore Street in the City of Buffalo to provide transitional housing for men being released from correctional facilities. In 1987, Father A. Joseph Bissonette was murdered in his rectory at St. Bartholomew's Church at 335 Grider Street, also in the city of Buffalo. Sr. Karen relocated HOPE House to this location and renamed it Bissonette House as a way of paying homage to the slain Fr. Bissonette. It was at Bissonette House that Sister Karen was murdered on Good Friday 2006 by one of the parolees who lived there. During his eulogy for Sister Karen, Father Roy Herberger declared, "If there was one word synonymous with Sister Karen, it would be 'forgive.'" Sister Karen did, in fact, forgive her killer in a letter she wrote fifteen years before her death that was found among her personal belongings. All across town, even stretching out across seas, there are remnants of Sister Karen Klimczak's life and message. They stand proud in countless gardens and windows throughout our area, uniting complete strangers under the belief of a better world. "I Leave Peaceprints," the white dove signs read. Each hopeful sign is evidence that Sister Karen's life held a deeper meaning, a commitment for all people to live nonviolently, and that her death only hastened the spread of her message throughout our community. Sister Jean Klimczak remembers, "Karen told me, 'You leave your fingerprints on everything. We need to be people who leave imprints of peace wherever we go in our world.' That's what she was about and that is what she challenged others to do."